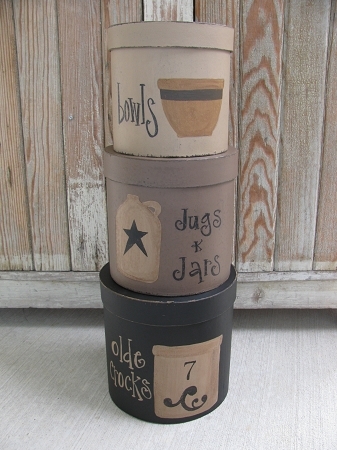 Primitive Stoneware Crocks Jugs Jars and Bowls Set of 3 Large Round Hand Painted Stacking Boxes. Designed for the Country Sampler Magazine. I personally love stoneware. My collection consists of crocks, jugs, Jars and old stoneware mixing bowls. This set was created to display a love for all of those things. 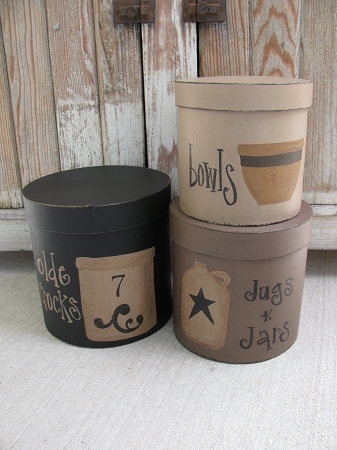 The bottom box is black with a crock painted on with the hand painted words OLDE CROCKS. Middle box is Mississippi Mud with a jug painted on and the words Jugs and Jars. Top box is khaki tan with a yellow ware stoneware bowl painted on with the words Bowls. Size stacked up 25" high and the bottom box is 9" diameter. Each box has been sanded for a time worn look and stained for a final finish. Hand painted, designed and signed by Heidi.